The groundhog is a type of marmot found in North America. The groundhog (Marmota monax) is a type of marmot, which is a ground squirrel or rodent. It is familiar to Americans for its weather prognostication on Groundhog Day. 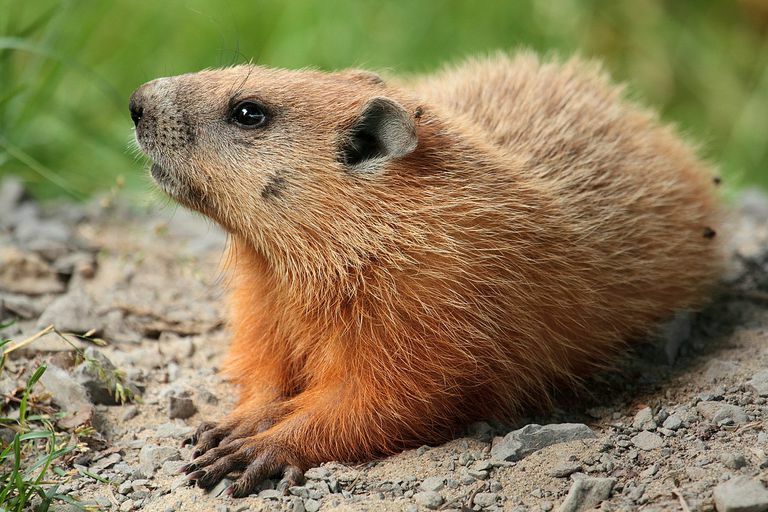 The animal goes by many names, including woodchuck, groundpig, and monax. The name woodchuck refers neither to wood nor to chucking. Instead, it is an adaptation of the Algonquian name for the animal, wuchak. Within their range, the groundhog is the largest ground squirrel. Adults average between 16 and 20 inches long, including their 6-inch tail. The relatively short tail distinguishes this species from other ground squirrels. Groundhog weight varies dramatically throughout the year, but averages between 5 and 12 pounds. The animals tend to be brownish in color with four ivory incisor teeth. Groundhogs have short limbs that end in thick, curved claws suited to digging and climbing. The groundhog gets its common name from its preference to open, low-elevation land. It prefers well-drained soil in fields and pastures. Groundhogs are found throughout Canada and in the eastern United States. Other types of marmots are common worldwide, but they tend to prefer rocky and mountainous habitats. Technically, marmots are omnivorous, but groundhogs are more herbivorous than most species. 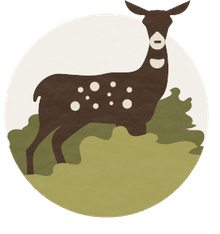 They eat grass, berries, dandelion, coltsfoot, sorrel, and agricultural crops. However, they will supplement their diet with fallen baby birds, insects, snails, and grubs. Groundhogs do not need to drink water if they can obtain it from dew or plant juice. The rodents store fat and hibernate to survive winter rather than caching food. Groundhogs are preyed upon by humans, foxes, coyotes, and dogs. Young may be taken by hawks and owls. Groundhogs are never found far from their burrows, which they dig in the soil and use for sleeping, escaping predators, raising young, and hibernating. Groundhogs mate after they rouse from hibernation in March or April. The pair remains in the den for the 31 or 32 days of gestation. The male leaves the den before the female gives birth. The usual litter consists of two to six blind pups that emerge from the den after their eyes have opened and their fur has grown. Near the end of summer, the young move off to build their own burrows. Groundhogs may breed the following spring, but most become mature at two years of age. In the wild, most groundhogs live two to three years and up to six years. Captive groundhogs may live 14 years. The IUCN classifies groundhog conservation status as "least concern." The rodents are abundant across their range and have a stable population in most places. They are not a protected species. Groundhogs are hunted as pests, for fur, for food, and as trophies. Although the rodents eats crops, groundhog burrows improve the soil and house foxes, rabbits, and skunks. So, maintaining a controlled population of groundhogs is beneficial to farmers. February 2nd is celebrated as Groundhog Day in the United States and Canada. The premise of the holiday is that groundhog behavior following hibernation may indication the approach of spring. Research on groundhogs given hepatitis-B may further understanding of liver cancer. The only other suitable animal model for the disease is the chimpanzee, which is endangered. The groundhog is also a model organism for studies of obesity and other metabolic disorders and heart disease. While groundhogs may be kept as pets, they may display aggression toward their handlers. Usually sick or injured groundhogs may be rehabilitated for release back into the wild, but some do form bonds with their caregivers. Bezuidenhout, A. J. and Evans, Howard E. Anatomy of the woodchuck (Marmota monax). Lawrence, KS: American Society of Mammalogists, 2005. ISBN 9781891276439. Thorington, R.W., Jr. and R. S. Hoffman. "Family Sciuridae". In Wilson, D.E. ; Reeder, D.M. Mammal Species of the World: A Taxonomic and Geographic Reference (3rd ed.). Johns Hopkins University Press. p. 802, 2005. ISBN 978-0-8018-8221-0.